We at Frenzel Beefmasters would like to thank you for visiting our site! Frenzel Beefmasters is located in Temple, Texas, and has been in the registered Beefmaster business for more than 30 years. Our program is based on performance and production. Unlike some breeders, we follow the six essentials and have performance tested cattle that produce the results you want. The goal of Frenzel Beefmasters is to produce efficient animals in a realistic environment and management program. We are committed to producing functional cattle that will work for our customers no matter what the location. Our genetics can be found in Florida, Georgia, North Carolina, Oklahoma, Kansas, Mississippi, Nevada, Texas, Mexico and even South Africa and Thailand. Frenzel Beefmasters are noted for their clean underlines, thick muscling and good udders. Lasater and L Bar herds. These are the foundation herds of the Beefmaster breed. We record birth weight, weaning weight and yearling weight, on every animal. Frenzel Beefmasters sells most of its bulls through the "Beef On Forage" Beefmaster bull sale managed by Gary Frenzel. This is a performance-based program that runs the bulls together in a contemporary group for 300 days. The bulls are run on grass with weights taken periodically for performance evaluation. The bull sale is held on the third Saturday of October in Brenham, Texas. The 2013 test currently has 168 bulls. 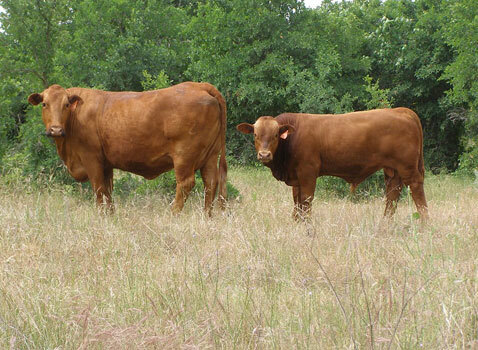 Females and other bulls are marketed through private treaty sales at the ranch. We are continually testing and selecting performance-tested bulls. By doing this we know that we are producing cattle with a superior ability to convert forage into pounds. Breeders will benefit from these genetics by the added weight in their calf crop. By having a controlled breeding season, we will eliminate any infertile cows that may exist. We continually strive to improve underlines and muscling in our cattle. Always remember - functional cattle make money!